Now a mainstay in the diagnosis of thyroid nodules, ultrasonography provides a high pretest probability of cancer when certain characteristics exist in a nodule, namely a solid or partly cystic nodule with irregular and blurred margins, mixed hypoechoic isoechoic areas and microcalcifications, and intranodular vascular pattern 99 . Malignant cervical lymph nodes have a characteristic pattern, appearing round, without a hilar area and containing intranodu-lar vascular flow. A Solbiati index (SI ratio of largest to smallest diameter) of about one and a complex echoic pattern or irregular hypere-choic small intranodular structures and irregular diffuse intranodular blood flow are the best indicators of malignancy in a lymph node 100 , which often provides information that alters the surgical approach 72 . These features are reviewed in detail in Chapter 26 by Dr Richardson. A section of the guidelines is devoted to medullary thyroid cancer (MTC), a rare disease that requires a dedicated, multidisciplinary regional service, dovetailing with that for MEN1 and MEN2. Developments in the molecular genetics of MTC have facilitated a rational framework for management, but the use and interpretation of molecular diagnostics requires The mainstay of treatment for MTC is total thyroidectomy and central node dissection the adequacy of the initial operation largely determines the long-term outcome of the disease. Prophylactic surgery is recommended for disease-free carriers of germline RET mutations the precise mutation found will guide the timing of the surgery 25 . Life-long follow-up is essential and includes monitoring of the tumor marker calcitonin. More detailed consensus guidelines for the diagnosis and management of the MEN2 syndromes are available 25 . The importance of MDT working for thyroid cancer is well recognized and is recommended by most thyroid clinicians across the world. In the UK the British Thyroid Association Guidelines have recommended that MDT working should be a mandatory requirement for any center involved in the management of thyroid cancer 21-30 . Small nonpalpable thyroid nodules are common in the general population and with increasing use of imaging techniques such lesions are frequently detected in asymptomatic subjects. The prevalence of thyroid cancer in such lesions is thought to be low (about 1-2 ) 54 . However, recent data suggest that in some series the inci dence of cancer may be as high as 12 and often associated with cervical lymph node metastases or multifocal tumors 55,56 . These findings are contradictory to the experience in other centers and until wider evidence to the contrary is available, observation of small (< 1cm), impalpable nodules in patients who are not otherwise in a high risk category (Table 7.2) is recommended 57 . The incidence of thyroid cancer in non-palpable thyroid nodules > 10 mm diameter appears to be similar to palpable nodules 58 and such nodules ought to be investigated. Some authors recommend that a benign FNAB should be confirmed by a second FNAB 6-12 months later, because of a false-negative rate of up to 6 of the initial FNAB 59 . The decision to subject patients to a second FNA has to be balanced against the probability of nondiagnostic aspirate,false-positive results (e.g. Thy3 in up to 7 of cases) necessitating surgery, reduction in cost-effectiveness, and heightened patient anxiety 35 . A small proportion of patients will develop new nodules or enlargement of their existing nodule, and some will develop thyroid dysfunction therefore some form of follow-up seems appropriate, although the optimal means of achieving this is unknown. Ideally a one stop clinic with access to biochemical testing of thyroid function (if not already available), cytology, and diagnostic ultrasound can provide rapid diagnosis and planning for those cases that require treatment. Patients can be assessed clinically, FNAB performed, cytology reported and if necessary repeated until an adequate sample can be obtained. Those patients who require surgery either for diagnosis or for treatment can have a consultation with the surgeon and the operation planned. Only a few centers are able to provide such a facility because of limited resources. The crucial aspect of a thyroid nodule service, however, is that it is staffed by clinicians and cytologists who are appropriately trained and experienced in dealing with thyroid nodules. The different ways general practice operates across the world causes some difficulties in attempting to describe a primary care approach to thyroid cancer. The approach of practitioners in areas where the specialist team may be immature or nonexistent will differ to that where the specialist team is highly developed and close at hand. We have identified the highest diagnostic and management level that a general practitioner (GP) might be expected to exercise in a remote context. GPs in better served areas may not need to exercise these skills, but should be aware of the tasks required for comprehensive care of these patients. Once recurrent or metastatic cancer has been diagnosed, consultations within the multidis-ciplinary team should lead to the most appropriate management plan. For recurrence in the thyroid bed or cervical lymph nodes, surgical re-exploration usually followed by 131I therapy is mostly preferred. Bone metastases can be treated with 131I, external radiotherapy, embo-lization, or orthopedic intervention. Metastases in the lungs and elsewhere not amenable to surgery can be treated with 131I. In otherwise uncontrolled end-stage disease chemotherapy with doxorubicin and cisplatinum has been tried, with limited success. death in 106 fatal cases of thyroid carcinoma were respiratory insufficiency (43 ), circulatory failure (15 ), hemorrhage (15 ), and airway obstruction (13 ) 43 . Complication rates associated with thyroid surgery and the consequences of thyroid surgery can be evaluated through follow-up data, local and national audit initiatives (e.g. the British Association of Endocrine Surgeons Audit), and analyses of case series. When obtaining consent for a procedure and in the approach to the final decision to move to an operation, patients should be given information about commonly occurring complications, which enables them to make their decision as to whether or not to proceed based upon a realistic understanding of the complications and the likely outcome of the operation. As noted above, thyroid hormone extracts from sheep or cattle were the first treatments used that demonstrated efficacy in ameliorating the signs and symptoms of hypothyroidism. Several synthetic derivatives were introduced in the 1960s which quickly replaced desiccated thyroid tissue for the treatment of patients with thyroid disease. Among these are levothyr-oxine (Levoxyl, Levothroid, Synthroid), synthetic forms of thyroxine (T4) and liothyronine (Cytomel), and the synthetic levorotatory isomer of triio-dothyronine (T3). 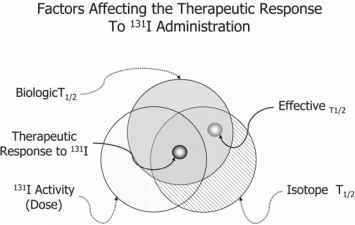 Moreover, in part due to the seminal work carried out by Prange and collaborators in the United States in the 1960s, the use of thyroid hormones in augmenting antidepressant response in depression was established. In patients with large thyroid remnants who are treated with radioiodine, immediate postablation TBS may be poorly sensitive for detecting uptake outside the thyroid bed also, the abla tion rate is lower than in patients with small thyroid remnants. Detectable serum Tg may be related to persistent thyroid remnants. For these reasons, a dxTBS at 6 to 12 months may be indicated. Whenever rhTSH is used to provide TSH elevation for dxTBS, an activity of at least 148MBq (4mCi) of 131I should be administered one day after the last injection of rhTSH. This underlines that performing a total thyroidec-tomy in all DTC patients will improve the quality and ease of the follow-up. PTC usually is unencapsulated, well differentiated, and sharply circumscribed from the surrounding thyroid parenchyma. PTCs bear almost pathognomonic cytomorphological changes, including nuclear grooves, folds, and invaginations, in addition to central nuclear clearing 47 . The cancer may be multicentric. PTC foci have a moderately dense fibrous stroma and tend to invade the space between follicles. Psammoma bodies are a cardinal feature of PTC 47 . The tumors may spread to normal surrounding thyroid parenchyma and regional lymph nodes. However, they are capable of distant dissemination as well. PTCs characteristically grow slowly 48 . The rationale for thyroid hormone suppression therapy (THST) is based on evidence that TSH is the main stimulator of thyroid growth and function, at least in normal thyrocytes 60 . It is not clear whether long-term levothyroxine (L-T4) therapy to partially suppress TSH is effective in treating thyroid nodules, which are of course composed of neoplastic (not normal) thyroid tissue 61 . The use of high dose L-T4 to fully suppress TSH in patients with benign thyroid disease is neither beneficial nor completely safe 62 . Therefore, THST for unknown nodular thyroid disease is not recommended for pedi-atric patients. The size of the lesion is usually easily and accurately measured using US. Smaller than or equal to 2cm is T1,2-4cm is T2 and greater than 4cm is T3 for tumors confined to the thyroid. Confusion arises when there are multiple nodules in contact with each other. The differentiation between the nodules may be indistinct, making measurement of individual nodules difficult. Local extension beyond the thyroid can be identified but again this can be unclear with large multinodular goiters. 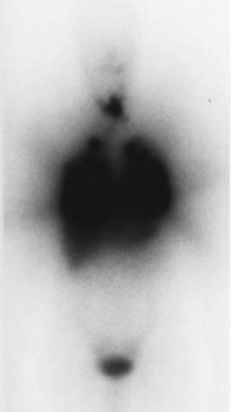 In a patient undergoing investigation for thyroid nodules, the identification of bilateral nonfunctioning nodules on the 99mTc pertechne-tate thyroid scan raises the possibility of MTC associated with familial MTC (FMTC), multiple endocrine neoplasia type 2A (MEN2A), or MEN2B 54 . The main role for 99mTc(V)-DMSA imaging is in the follow-up of patients after surgery 56 . In primary MTC, 99mTc(V)-DMSA can confirm a clinical suspicion of MTC while the calcitonin results are awaited. Papillary and follicular tumors of the thyroid do not take up 99mTc(V)-DMSA and positive uptake in a cold nodule on a 99mTc pertechnetate scan is strongly suggestive of MTC. 99mTc(V)-DMSA whole-body imaging is also useful when planning surgery to stage the disease. It is probably the most effective imaging agent for demonstrating soft-tissue and bone metastases. Upper eyelid retraction in thyroid eye disease occurs due to a combination of primary factors (adrenergic stimulation, inflammation and fibrosis) and secondary retraction due to inferior rectus fibrosis - with secondary overaction of the superior rectus levator complex. If secondary upper eyelid retraction is present, the restriction of ocular motility should be addressed first, with inferior rectus recession. Primary upper eyelid retraction is treated by one of the several techniques for graded levator tenotomy (Chapter 7), but with all methods it is particularly important to completely divide the lateral horn of the levator aponeurosis and to maintain a levator action on the medial part of the upper eyelid. Nuclear medicine imaging continues to have an established role in the management of patients with papillary and follicular thyroid cancers, with 131I scanning remaining the routine imaging technique for localizing remnant and recurrent disease. The development of recombinant human TSH offers increased flexibility for imaging and treatment, whilst reducing the side effects of thyroxine withdrawal. The newer radionuclide imaging techniques remain underutilized, despite good evidence for their sensitivity in detecting tumor recurrence. The development of new agents continues with the potential for new therapeutic agents. The importance of the development of evidence-based strategies for the optimal integration of radionuclide imaging in the diagnosis and follow-up of patients with thyroid cancers needs to be recognized. Most patients with thyroid eye disease will have relatively few symptoms and signs, and many will require only topical lubricants during the active phase of the disease and no long-term therapy. Patients without proptosis when the disease is inactive, but with persistent lid retraction or incomplete lid closure, may need eyelid surgery to protect the cornea (Chapter 7). Likewise, squint surgery Management of more severe and significant thyroid eye disease should be first directed towards suppression of orbital inflammation and later the restoration of orbital function. Many surgeons perform an operation called near-total thyroidectomy, but its definition is open-ended,leaving much doubt as to the actual extent of surgery and the amount of thyroid tissue left behind. For this reason, the National Cancer Center Network guidelines 28 on the treatment of thyroid cancer avoid this term. In practice, many patients have substantial thyroid remnants when evaluated by thyroid ultra-sonography and thyroglobulin (Tg) determina tions even after reportedly undergoing total thyroidectomy. Thyroid ultrasound may be useful when the extent of surgery is in question, since leaving a thyroid remnant smaller than 2g facilitates postoperative 131I ablation. A proposed thyroid MDT standards list is given in Table 3.1. This has been modified from the Breast Cancer Standards 2004 and therefore is not the definitive document. Thyroid cancer MDT measures based on the NICE IOG will be published by the Department of Health in due course. However, Table 3.1 will give some idea about the comprehensive nature of the standards that an MDT will have to follow and can act as a discussion paper for development of multidisciplinary practice for any center wanting to develop a reliable service framework. The patient should be euthyroid before elective surgery. Careful questioning, examination and thyroid function tests should be performed. If the mediastinal mass is compressing the trachea, then the patient may be symptomatic. If the tracheal diameter is reduced by more than 50 , then the patient will develop stridor, which may be positional or occur only on exercise. CT or MRI should be used to gain more information about the degree of tracheal compression. If significant, removal of the thyroid should take priority over elective varicose vein surgery. If there is no, or minimal, compression, then surgery may proceed. Regional block is an anaesthetic option. Thyroid scintiscans may in specific circumstances help to distinguish a benign hyperplas-tic nodule from a potential follicular neoplasm. Hyperplastic nodules are characteristically hot on scintiscans, whereas thyroid cancers are typically cold. Hot nodules have a very low incidence of malignancy 39 . However, technetium-99 thyroid scanning may be misleading and 123I scanning is preferable for classifying thyroid nodules as hot or cold. 123I is expensive, and the classification of a nodule into the hot or cold category may subjective 47 . 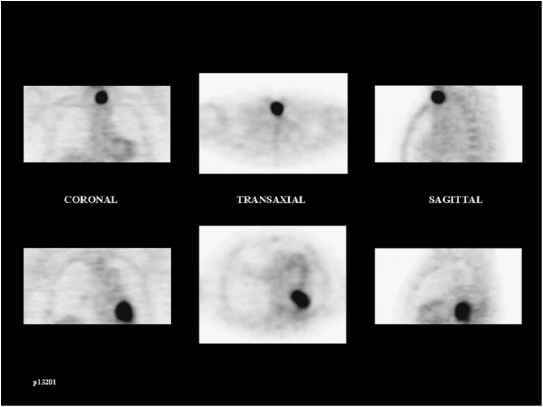 For these reasons most centers do not perform thyroid scintiscans as part of the initial assessment of thyroid nodules. While the relatively low mortality rate of thyroid cancer in general is due to the preponderance of well-differentiated carcinoma, a subset of rare thyroid tumors exist that exhibit aggressive behavior and poor prognosis. These require careful consideration and different treatment paradigms to optimize clinical outcome. Extremely rare types of thyroid cancer include thymus-like tumors, mucoepidermoid carcinoma, spindle cell tumor, mixed medullary fol-licular cancers, and teratoma. In view of the limited literature on their management these extremely rare types are not covered in this chapter. The diagnostic approach to thyroid nodules differs somewhat according to the type of physician who first sees the patient in consultation and the availability of specialist teams. This is apparent in Section II, which reviews the diagnosis of thyroid cancer in four separate chapters by Drs Perros, Mitchell and Leith, McNicol, and Wiersinga (Chapters 7-10). Each has the same general approach but with a somewhat different slant, according to the circumstances of their practice and specialty. Still, the overall approach is the same in most urban areas. Patients with suspected or newly diagnosed thyroid cancer should be referred to a member of the MDT. Guidelines for the investigation and management of thyroid swellings can be found in Chapter 7. Clinical features which should give rise to suspicion, and which indicate the need for urgent referral (within 2 weeks), are any of the following in association with a thyroid lump newly presenting lump or increasing in size, a family history of thyroid cancer, a history of previous neck irradiation, young patients (< 10 years) or old patients (usually > 65 years) Diagnostic assessment will include clinical examination, thyroid function tests, thyroid autoantibodies, and fine-needle aspiration cytology (FNAC) with or without ultrasound scan guidance. FNAC is an essential diagnostic procedure that is used in the planning of surgery. The cytology should be reported by a cytopathologist who has a special interest in thyroid disease and is a member of the MDT. An adequate sample is required and reports should be based on descriptive text, but should include a numerical coding as a guide towards specific further investigation or therapeutic action. 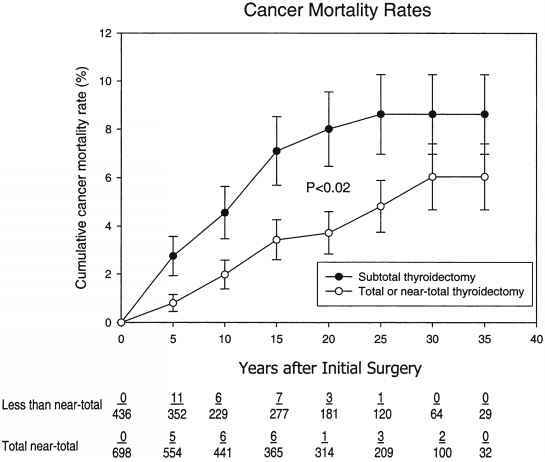 While much discussion is taking place about the implications of this approach it is also becoming clear from many publications that outcomes of major and specialized cancer surgery and treatment of rare cancers like thyroid cancer have a positive volume-outcome relationship in that outcomes might be better in high volume hospitals than in hospitals that see only a few patients a year 12-16 . On the basis of these and other publications it may be that in the future thyroid cancer surgery and management will be centralized or concentrated in higher volume settings, which in other countries is a concept known as regionalization 17,18 . Functioning thyroid adenomas (toxic nodules) often have somatic constitutively activating mutations of the TSH receptor 27 . Molecular rearrangements or mutations in the pathogenesis of differentiated thyroid cancer (RET PTC, BRAF) have been implicated 26,28 . Medullary thyroid cancer is frequently associated with activating somatic or germline mutations of the RET gene. Mutations in tumor suppressor genes (p53) have been reported in anaplastic thyroid cancer 29 . External beam irradiation to the thyroid in childhood increases the incidence of both benign and malignant thyroid nodules 30 . Patients with adequate cytology which is intermediate (Thy3 and Thy4), require surgery in order to obtain an accurate diagnosis. The risk of malignancy is approximately 20-25 in Thy3 nodules 52,53 and 40-50 in Thy4 lesions 41 . Lobectomy is the operation of choice for nodules with indeterminate cytology (Thy3 or Thy4). If the histology is benign, the contralateral thyroid lobe will be adequate in most cases for maintaining euthyroidism without a need for thyroxine therapy. 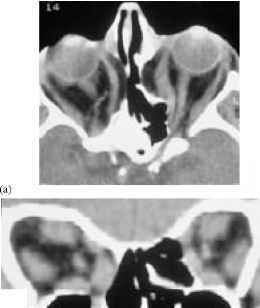 If, however, the lesion is malignant, the surgeon can proceed to a completion thyroidectomy without having to reexplore the same lobe, thus minimizing the risks of hypoparathyroidism and recurrent laryngeal nerve injury. 'The masqueraders can be grouped into primary and secondary groups. The primary (most common) masqueraders are depression, diabetes mellitus, drugs, anemia, thyroid disease, spinal dysfunction, and urinary tract infection. A secondary (less common) list includes chronic renal failure, HIV AIDS, rare bacterial infections (e.g. subacute bacterial endocarditis, tuberculosis), systemic viral infections (e.g. infectious mononucleosis, hepatitis A, B, C, D, E), neurological dilemmas (e.g. Parkinson's disease, multiple sclerosis), connective tissue disorders (e.g. systemic lupus erythe-matosus, polymyalgia rheumatica). It is in this context that problems in identifying and managing cancer of the thyroid in general practice become obvious. GPs will often be the first port of call for a patient who has found a thyroid nodule, and may be the one who identifies the nodule incidentally either on physical examination or on ultrasound. Should a diagnosis of thyroid cancer be possible, it is essential that the possibility is canvassed with the patient before referral to the specialist. Responses to the diagnosis in other cancers when patients are not forewarned can range from disbelief to anger, and specialist colleagues are put in an invidious position when there is no preparation 16 . Two levels of endocrine surgery training now exist surgical residency and endocrine surgery fellowship training. The baseline level of training for thyroid surgery is received in surgical residency and is a mandatory component of general surgery and otolaryngology programs. This chapter will focus on the general surgery perspective. Additional surgical endocrinology fellowship training remains an informal process at present, but discussion regarding the standardization of formal fellowship training is under way within many associations, including the American Association of Endocrine Surgeons (AAES). If you can not wait, then get The Natural Thyroid Diet now. Your Download will be instantly available for you right after your purchase.